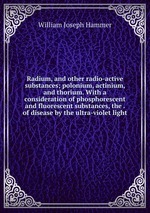 Аннотация к книге "Radium, and other radio-active substances; polonium, actinium, and thorium. With a consideration of phosphorescent and fluorescent substances, the . of disease by the ultra-violet light"